September 2016 Horoscope for Cancer star sign predicts that the House of Home and Family will become very dominant by end of the month. It is time to concentrate on enhancing emotional strength and domestic environment. Professional concerns will be in the back seat for the time being. There will be frenzied activity in the home front. The Cancerians will invest in buying new houses and personal luxurious things. Cancer, you have to be independent as well as rely on the grace of others depending on the situation. You can assert yourself sometimes, while you have to be flexible at other times. There is some uncertainty in the way things are shaping up in September 2016. Cancer born students will be forced to make vital alterations to their curriculum and educational institutions in September 2016. Your personal faith and religious institutions to which you have access will undergo radical transformations. You will make course corrections and remove any defects you come across in your beliefs. The Cancer monthly prediction for September 2016 says that career progress should be based on the emotional strength you have gained during the month. Do not change jobs or venture into any new business this month. 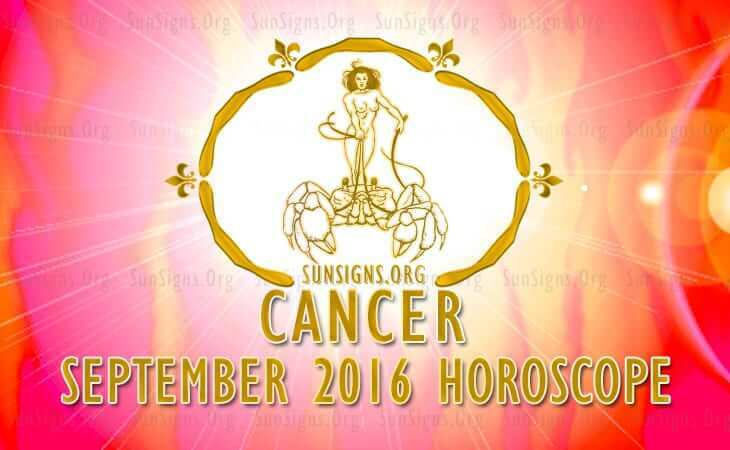 The Cancer 2016 September astrology forecasts suggest that earnings are superb this month. You can boost your earnings with the help of good sales promotion and marketing techniques. You have the help of planet Mercury in achieving your financial goals. Family members will assist you to accomplish your monetary targets. The 2016 romance horoscope predicts that love is quite good this month for the Cancerians. Your commitment to family relations will affect your social engagements. There will be harmony with your spouse and family members. You may shift residence or make modifications to the existing one. The end of the month will bring in major changes to the family and all relationships. Cancer compatibility with family members and neighbors will change for the better. You will question your current relationships and make a decision whether to stay or break up. This is not a good month for the Crabs to plan for a baby. The September 2016 Cancer horoscope suggests that health will be excellent till the third week after which it becomes delicate. Movement of Jupiter to Libra will make emotional fitness more important than physical well being. Harmony with your spouse or partner and social contacts will enhance your health. You are looking at spiritual healing as an alternative to remain fit. This is a good time to change your personality for the better. The 2016 September horoscope for Cancer zodiac sign predicts a change in your personal outlook and dependence on your intuition.